My first impression of Hanami-koji was that it was clean and orderly. Wooden machiya merchant houses line this street of ochaya (tea houses) and expensive restaurants serving Japanese haute cuisine. It was late afternoon but the machiyas were still shuttered from the world. 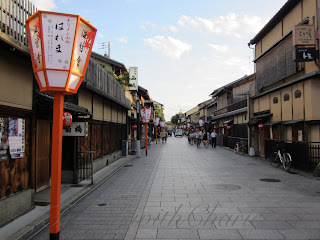 It was relatively quiet as I walked up the street hoping to see a geiko (term for geisha in Kyoto) or two.